Coming out of the Harmonie Park / Bricktown area, all along Gratiot used to be the German neighborhood (aka, Dutchtown). The surnames etched on the cornices and entryways of the abandoned merchant’s blocks that still line Gratiot echo this. Here is St. John-St. Luke's Evangelical Lutheran Church UCC, at 2120 Russell Street. If you can't picture where it is, that's because it practically sits in the shadow of the much more magnificent St. Joseph's Catholic Church. This now-unknown church was built by the first ethnic German Protestant congregation in Detroit. It was organized in 1833 as St. Johannes (John) Church by a Swiss missionary named Rev. Frederich Schmid, who had been stopped on his way to Ann Arbor by a group of 25 Detroit Germans. They begged him to stay there and minister, since they had no service in their language available. St. John's German Evangelical Lutheran Church of course formed splinter congregations who spun off from the mother church over the decades, most notably Historic Trinity Lutheran Church, which sits across Gratiot Avenue from it. It consists of St. John's members who wanted to follow a stricter Lutheran doctrine. This building is St. John's third, having been built in 1873-74, designed by Julius Hess (also Swiss). You may remember him as the same architect who designed the Trumbull Avenue Presbyterian Church from an earlier post. This was Hess's first major commission in the city. Then, it had a spire which at the time actually made it the tallest building in Detroit, though the spire was chopped off by the 1930s. 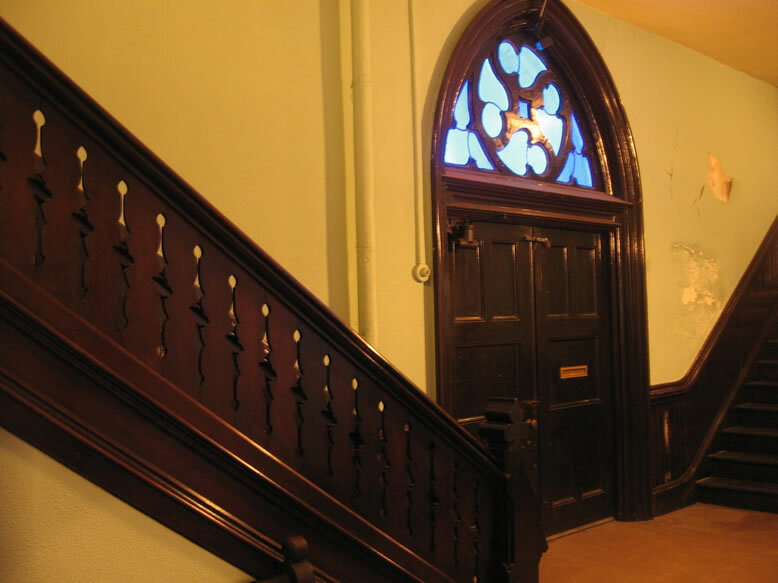 It was not until 1947 that the congregation was able to afford the stained glass windows, which were made by Detroit Stained Glass Works (a firm founded by Germans). And if you look closely at the first photo in this set, you will see areas of the church's "stone" exterior have chipped away to reveal...brick. That's because it is actually built of brick and in 1914 a textured cement veneer known as "Formstone" was added to give the impression of stone block. Though it is now driven by an air blower it was originally water-powered. The organ is featured on the cover of a four-CD set entitled Historic Organs of Michigan. In the album sleeve of this musical collection are more historical notes, which indicate that the organ was actually modified several times, starting in 1905 by the sons of Detroit organ-builder Andreas Moeller with the addition and moving of some pipes and ranks. In the 1970s the Detroit historian and organ enthusiast William M. Worden renovated the instrument, bringing it back from "the brink of unplayability." David Wigton did more restoration later. The organ was rededicated in 1985, to celebrate Johann Sebastian Bach's 300th birthday. St. John’s was a final stop on the Underground Railroad. One method that the congregation used to employ in the smuggling of slaves to Midnight was to stage fake funeral processions, which would carry a casket (containing a fugitive slave) on a bier, and march all the way down to the riverfront where it was then loaded on a boat and taken to Canada. Above is one of the actual caskets that was used in such operations, and dates to the 1840s. The church has it on display in a glass case next to the organ. Gehrke went on to join the ranks of the firm Spier & Rohns, who are noted for designing many of the historic Victorian-era depots of the Michigan Central, and Grand Trunk Railroads, as well as the Chamber of Commerce Building in Capitol Park, Sweetest Heart of Mary Church, and First English Evangelical Church. They are being bent (rotated, if you will) downward and inward by the weight of the roof. This is not good; I also remembered seeing the typical plaster and paint decay from the last time. This church is in need of real work. I recognized one especially German-looking parishioner…the same white-haired, barrel-chested, suspender-clad old timer who hosted us last time was here again, booming in his powerful voice as he spoke with immense pride about his church. His name was Günter, and he looked like he had been a carpenter his whole life; his family line stretched back all the way to the founding of the church. The dude was tough as rocks, and seemed to be the patriarchal figure of the church (though not the pastor). He was asked how many people show up for service these days. He answered, “On a good Sunday…ten or fifteen.” One of the tour guides from the historical society stood up and commented on how after 37 years of doing these church tours, he had never seen a more tireless, hard working congregation than St. John-St. Luke’s. The St. Luke congregation was organized in 1888, having spun off from the original St. John's. They merged back with St. John's in 1969 to form the present St. John-St. Luke's. The "re-"merger was brought on by precipitating factors that were present in WWI and felt even more gravely in WWII. People of German obvious heritage were scorned, and many went to great lengths to hide their ethnicity. At a place like St. John's or St. Luke's German Evangelical, it was pretty hard to deny Teutonic roots, and many families changed their surnames or left the congregation entirely, simply to avoid the "Anti-German Sentiment." As a result, both churches were seriously hurting for members by the 1950s when white flight also began stripping away their flock. In 1969 the pastor of St. John's suddenly passed away, and that was when St. Luke's saw it best to merge the two churches in order to survive. About that same time was when the old wealthy German families who had ancestral roots to the church since its beginning all began dying off as well. Luckily many left their legacies to the church, and according to Günter that is basically the only reason it has any financing at all today…it is still living on that life support. This stop on the tour was also the lunch stop, just as it had been my first time through. I remembered the food as being excellent; it was all made by the church members in the kitchen from family recipes likely passed down from the old country. The German-style potatoes stand as perhaps the most outstanding I have ever eaten, bar none. They were exactly the same this time as they were the first time, three years prior. Bratwurst and red cabbage were also served...I found myself reaching for a stein of frothy Stroh's to wash it down with, but I guess they don't serve that kind of thing in church. When this church finally succumbs to old age and becomes yet another crumbling piece of fodder for HDR-flavored ruin candy, almost two centuries of family history will be evaporated, the physical and verbal links to the past forever lost. It is on the National Register of Historic Places, not that that makes a damned bit of difference. Who is going to carry on these ancient traditions such as organ playing (not the same as piano playing! ), oral culture, hammerbeam repair, and the handed-down culinary secrets of German style potatoes? How are all these architecturally glorious / hard to maintain churches going to be looked after by the coming generations of spoiled apathetic agnostics such as myself? They can’t all be saved…not without congregations. America is on the cusp of witnessing the greatest loss of history, memory, tradition, and culture in generations. This is not St. Pat’s Cathedral in Manhattan; this is one of the many landmarks that falls under the radar of all but those who are connected to it by blood and will most likely pass into oblivion with little fanfare. I would say less than 100 living people in the entire world know enough about, or care enough about this church to save it if they could. And their average age is probably about 70 years old. Mankind is going in reverse.